Okay – here’s a substantially revised version of chapter four. I threw out the introduction and the final section of the chapter, moved a middle section to the front to create a new introduction (which I’m not sure I’m happy with – are you? 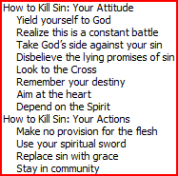 ), smoothed out some transitions, retitled a couple of subsections, inserted most of the material on indwelling sin from chapter seven, and added a (hopefully) clarifying chart showing the relationship between our position and practice in Christ. This revision completely changed the set up of the chapter. It’s now not focused on a problem (whether legalism or license, though I mention the latter), but on how we are to take the resources of the gospel (positional sanctification/union with Christ) and apply them to our lives by “living in sync with the gospel” (progressive transformation). I’ll be curious to see your critique. I’m sure it still needs work! This is slightly revised from what I sent yesterday. I clarified the chart to use the same language (once-for-all-ongoing, definitive events vs. ongoing, personal, practice) that I revisit in chapter 6. Here’s one more idea that I’ve had – should we consider swapping around chapters 4 and 5? There’s a very key link between 4 and 6. But on the other hand, there’s also a key link between 3 and 4. Chapter five, while important, seems somewhat out of the logical flow of the argument. Have you noticed this? Do you think it matters? No surprise: After editing, two of the headlines (underlined in blue) were reworded, and four (underlined in green) were shuffled around to form a more logical progression. This logic becomes more obvious when reading the text. Really. In part of Chapter 7, the draft had twelve subsections designed to help the reader get a better handle on mortification. Whenever I come upon a list of any significant length like this, red flags go up, because in my experience such sections can nearly always be improved by reordering and/or the introduction of subcategories. I began by writing out the headings on a pad, not even reading (for this pass) any of the associated text. First I labeled each heading as being more in the nature of attitude/knowledge, or more in the nature of practice/application. Then within those categories I tried to put the items into some sort of logical and helpful progression. The result is shown below, original order on the left and new on the right. I will not be surprised if line editing results in some further changes; Brian has wondered if this might be an area where consolidation or elimination of some categories could help shorten the chapter. Here's another effort at succinctly representing edits without providing a confusing amount of detail. Toward that end, I'm also leaving out some minor edits to a few paragraphs. Yellow highlight means text was moved aside and may appear elsewhere in the chapter. I thought the idea of sin as a wild animal was worth unpacking a little, offering the reader a longer and more interesting introduction while extending and deepening the teaching content. As with other edit samples I have shared in this blog, some of what appears as "my" text are Brian's ideas moved forward from later in the chapter. Any or all of what appears below may change after Brian sees it. Somehow I am still surprised at how the process of line editing can cause me to go back and revisit the work at a higher level. When I posted an excerpt from Chapter 6 on Holiness, after having read through it, I thought it was in fairly solid shape. But once again — by now I should know to stop predicting these things — when I settled into the editing process I realized that additional changes were probably in order. This is not Brian's fault. Writing anything of any substance is a process of continual reworking. I once read that in a reasonably well-written book the average sentence will have been redone seven times. That sounds about right. If anything, it's conservative. As I recall, Josh Harris once told me he rewrote the opening chapter to I Kissed Dating Goodbye 12 times. Of the 12 or 15 complete books I have edited, only two did not need substantial work, and one of these still needed to have several chapters shuffled around. Yesterday I spent six or seven hours working through the edits and rewrites Kevin recommended for chapters two and three. It was exciting for me to see how Kevin's suggestions helped me reshape content (especially in chapter three, which is more theologically dense than most of the other chapters) in ways that will make it more accessible to the reader. Kevin had already moved some stuff around to clarify the flow of thought (see the elusive goal of linearity). But this, along with some of his suggested rewrites, helped me see ways to make the chapter even better by (i) simplifying an overly technical section of the chapter that needlessly introduced new theological concepts and (ii) making the final 1/4 of the chapter more concrete in application.